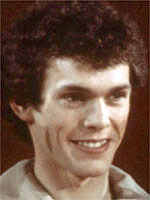 Britain's John Curry turned figure skating on its head in 1976 when he swept the board in men's competition, winning the Olympic gold medal as well as the world and European championships. "My goal is to write music on ice," was how he summed up his approach, considering himself to be a "skater choreographer". His Grand Slam in 1976 marked a turning point in the sport, the fruition of his brilliant and innovative strategy of removing the classical performance from the straight-jacket in which it had been confined and injecting it with a choreographed energy never before seen on the ice. The "music" - whose inspired notes moved figure skating from elegant sporting discipline to art form - was important too, in that ultimately it sealed the fate of the compulsories, an exercise Curry loathed and which had kept him off the podium on more than one occasion. The beauty of Curry's approach lay in his desire to incorporate the most spectacular and technically difficult aspects of the sport into a finely-tuned, choreographed peformance. Curry loved dancing and skating from an early age and would have become a ballet dancer if his father had let him. He left school at the age of 16 after his father died and moved to London, where he began working with the coach Arnold Gerschwiler. Most of Curry's meagre earnings in this tough early period went to pay for dance and figure skating lessons. In 1973 he made a crucial decision to begin work with the hugely respected coach Carlo Fassi and moved his training base to Colorado in the United States. Taking up competition at a relatively late age, he had his first international success at the 1974 European championships, where he won the bronze medal. It was the start of a meteoric rise to the top. Curry's wonderful Olympic victory at Innsbruck was the highlight of his career and it gave Britain their first ever men's gold medal at the Winter Games. Turning professional, the "Nureyev of the ice" created his own figure skating show called "The John Curry Theatre of Skating" which allowed him to give full rein to his skills as a choreographer. Curry discovered he was HIV positive in 1987 and sadly by 1991 he began to suffer the symptoms of full-blown AIDS. He returned to England where he lived for three years before dying on April 15, 1994, aged just 44.